Add this issue to your photographic library for information on the Canon EF-S 55-250mm f4-5.6 IS USM lens. Plus techniques on shooting car trails, DPP for beginners, and EOS unchained - no need for cables when you use WiFi. 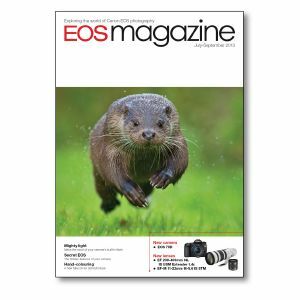 New products EOS 70D camera and lenses EF 200-400mm f4L IS USM Extender 1.4x, and EF-M 11-22mm f4-5.6 IS STM lenses. World of EOS Canon summer cash back, firmware updates, photographing Holy Island. Mighty light Don't dismiss the built-in flash! We show you just how useful and versatile it can be. Secret EOS Our guide to the lesser-known features and functions of your EOS camera. Surf's up Danny Sepkowski braves Hawaii's infamous towering surf with his EOS. Live View Live View has many unique features, which make it a useful tool rather than a fancy gimmick. How was it shot? Liam Marsh carefully visualises and plans his shoot to capture a winning image. Freelensing If you want some lovely soft images, try shooting without a lens attached to your camera. HDR imaging New software and camera features make high dynamic range images much easier to achieve. Hand-Coloured Produce individual works of art by hand-colouring your black amd white prints. Freelance diary Miles Willis shows how to shoot great interiors with a couple of Speedlites and a reflector.